Life is good. It is hectic, but it is good. I suppose it’s better to be busy than not, so I’m not complaining. So first thing we’ll talk about is this benefit show you got coming up here in L.A. How did that come together? Over the years we’ve been raising money through a number of different vehicles, whether it be tours where we dedicate a lot of the profits of the tour to a charity, etc. I think this year it occurred to us if we could keep it local, rather than spend the kind of money that requires you to get on the road and run around, and add an auction and do all these extra sort of money raising type events around the charity and around the night, that we might be able to make a little bit more money. We’re hoping that this is the first of many of these events to come. Is this the first time you’ll be playing two different sets with different bands? Yeah. There was one night where we had the Something Corporate guys join us onstage and do a couple of songs, but this will be the first time we’ve ever had both bands playing a full set of music, for sure. Do you know which band is going to be the closer? Yeah, I think Jack’s is going to close the set. I’m hoping to have a little bit of a mix throughout the night, maybe have them come and join us for one song. I think Jim, who produced both of the Jack’s records and both of the Something Corporate records, might come out and play a little bit with both bands. I think it’s less about who’s opening and closing and more about us all being onstage together at this point. What’s the latest with the Dear Jack Foundation? We’ve been doing well. Obviously, this year is a hard year for any charity, considering what’s going on in the economy. We were very active with the Leukemia & Lymphoma Society’s Night Walk, and hopefully we’ll have at least $50,000 raised for them. Obviously, we have our private donors that still are a huge part of the foundation as well. Then these charity events we’re hoping will add more dollars to the foundation’s pocket, and therefore to the other charities that we fund as a result. We’re hoping we put more in the pocket this year than before as a result of this foundation and event. Has this charity exceeded your expectations in a way? I think I’ve continuously been proud. I don’t want to say surprised, but I’m impressed by the outreach from our fans to support the charity. I never anticipate that just because you’re a fan of the band, you’re going to in turn be somebody who supports a very specific and personal goal of mine, which is to help fight these kinds of cancers. Every year it seems we make a little bit more, and more people find out about it. I think obviously with the release of documentary last year, that was a huge event for us. We were out on the Warped Tour for the first time ever this year, and had a lot of kids pick up a T-shirt and support the foundation that way. While I’m always impressed and always excited, I always feel like we could do more. Speaking of the documentary, when I saw it last year I was pretty blown away by it. What kind of response have you gotten back from the film? It’s been pretty powerful. I think in a lot of senses it’s kind of like the records have been. It’s obviously commercial to some extent, and people can access it, but it’s sort of developed a fanbase cult of its own. I think that’s what we wanted for it. We weren’t trying to jam this documentary down anybody’s throat. Our hope was that people would find it. Fans would find it. People that are struggling with a disease on any level, whether it be from the point of view of somebody who actually has come across cancer or another illness, or their family members or friends that are having to watch – that they’ll sort of find this documentary and gravitate towards it at a time that makes sense for them. I definitely noticed over the course of the past year, aside from the fans who want to know what that experience was like for me, people of all walks of life who are fighting cancer from any level are reaching out and saying that they felt like it was a helpful tool in their recovery or their process of fighting a disease. It’s been a pretty powerful thing for me in my life to see how sharing a similar experience with people will connect you to them. Is your health still good these days? Yeah, we’re celebrating this year is my fifth year in remission. They never call leukemia a cure, but after five years they definitely say your chances of relapse go down significantly. This is a milestone that, needless to say, I’ve been very eager to reach since I was diagnosed. At times it felt like I never would reach it, or it was so far away. It’s been a big celebration this year, kind of feeling like that part of my life is behind me. Obviously, not the fight to help other people, but my own personal fight seems pretty far in the distance right now. Congratulations on that, man. That’s so awesome. So a little bit ago you did that Something Corporate reunion tour. What were your thoughts going into that and how did it match up with those? I think going into it I was extremely nervous, to be honest. Being onstage with a band is a really personal thing. A whole lot of its success depends on the chemistry and connection of the people onstage. When you do that for years with another group, I think there is a fear going into a tour with a completely different band. It’s going to take a minute to figure out, but I have to say my expectations were far exceeded. We got out there and it was like old hat. We knew the songs. We knew each other. The chemistry was there. I think in a lot of ways for all of us it was this celebration. Wow, look at what we’ve accomplished over five years. Can you believe people will still pay for a ticket after all this time of not putting out records and not touring, and that we could fill up a lot of venues and just have the night be so fun? It was a great experience for all of us. I know a lot of people are wondering if you’ll ever do other recordings at some point. What’s the status on that? There is no status. I get hit up by so many people saying, “The rumor’s out there that you guys are making a new record.” I always hate to throw water on anybody’s hopes, but at this point it’s just not where I think any of us are at in our lives. Josh is in the middle of finishing law school and beginning to study for his bar exam. I’ve obviously started something with Jack’s Mannequin that I really am passionate about and plan on pursuing. I think we all have these lives that we’ve taken on since we put Something Corporate on hiatus. Sure, way down the line at some point, in the same sense how this tour came together, maybe we’ll go, “You know what? This would be fun to do.” But I definitely would hate to insinuate that that would be coming anytime soon. I know where we’re all at, and I just know that especially in the next few years I don’t see it happening. 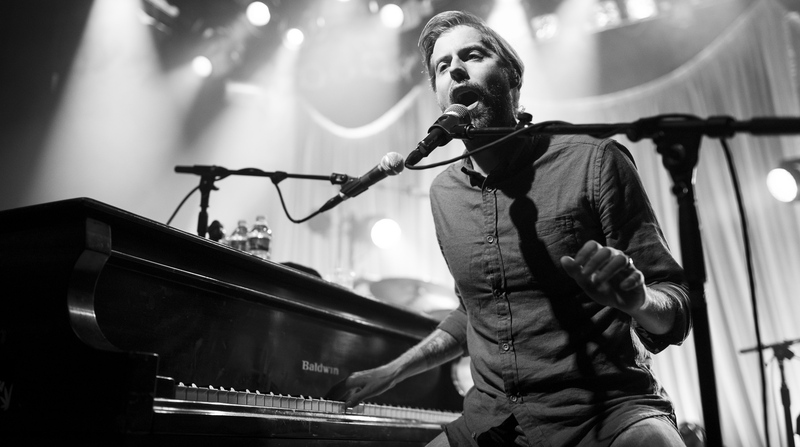 Right now, you’re in the thick of the next Jack’s Mannequin album. What’s the progress on that? It’s going great. We actually wrapped up a two-month stand in Joshua Tree yesterday. We were out there, and have written dozens of songs for this next record. We got to that moment where, rather than doing what I think a lot of bands are doing, which is going into the studio and just Pro Toolsing the hell out of their records, we wanted to approach this from the most organic and natural way possible. So we went out to the desert and learned these songs. We’ve been traveling between Joshua Tree and Valencia, where the studio is we’re working out of, and tracking the songs live. Basically, we’re in the process right now where we have 10 or 11 songs recorded, and we’re probably going to record another five or so songs and basic tracks live. Then we’ll circle back through the whole batch and do guitar overdubs and vocal overdubs. The kind of stuff that is the soft polish that goes on a record when all is said and done. We’re kind of starting to enter into that part of the process over the next couple of months here. What are you writing about with these new songs? Is there anything specific at all? Yeah, I think for me a lot of this record will be like Everything in Transit. That record was a very interesting time, almost like a coming-of-age sort of thing. It was me coming from the Something Corporate thing and starting to find my feet. I think that record hits on a lot of those sorts of themes, of the emotion of a young life coming into focus. Passenger, for me that record in a lot of ways was about what I would consider a very turbulent time. I was sort of finding my peace after this crazy crisis that I was in. I would like to think that this newest record is going to be about where I’ve arrived at. There’s a lot of emotion in the first two records of trying to find myself, and I hope that this record is me found in a way. I find that a lot of these songs are hammering home on the themes and complexities of love, and how that plays into a life. I think there are other songs that are even reflective in a lot of ways. There’s a tune that’s been hanging around for years, and it’s definitely a bold title, called “Hey Hey Hey (We’re All Gonna Die).” It’s this song that I didn’t feel bold enough to throw on a record, or throw on the last record I should say, but I think that sort of encompasses the experience of the last five years and just the reality of all our mortalities. There are a lot of songs that speak to a life that’s finally found, whether it be settling or at least a greater understanding of how far I’ve come the past five or 10 years. How would you describe the music stylistically? Is it more like Transit, as you were saying? We’re still so much in the development phase that it’s hard to say. We’re going to record probably 16 or 17 songs, and try to boil that down to hopefully 10 or 11. The songs that are chosen will say a lot about what the record ends up as. For me, I think it takes from both albums stylistically. I think there’s a good amount of tempo on the record. I want this record to be in a lot of ways upbeat. While there are definitely heavier subjects tackled in the lyrics on the album, my goal is to still have it be a record you could hear outside in an amphitheater in the summertime. You know what I mean? Feel like you’re sort of celebrating, and I think we’re in the process of fusing that right now. I’m hoping that it still is to some extent a record that has a lot of movement and has some real good foot tapping to it, some danceability. I also remember hearing earlier this year that you wrote a couple songs with Matt Thiessen. Did anything come of those ones? So we had these super-inspired days down in Tennessee at his house and wrote a song day for three days down there. I think at least two or three of the songs that we’ve written together over the course of the past year will end up on this record. Truthfully, a couple of them are my favorite things that I’ve done so far for the record. I think we got in a flow. Whereas sometimes you’ll overthink your writing, having somebody else there inside of the song to quickly go, “No, no. Let’s go in this direction.” We were really nimble, and I think we wrote a couple of great songs. One of them is called “Amy, I,” which is quickly becoming one of my favorites for the record. There’s another one called “People, Running.” We haven’t yet tackled it in the studio, but I’m pretty hopeful that it’s going to happen. Then there’s another tune, “Platform Fire,” which I shot off randomly at a little charity event I did recently. It’s not necessarily the best version of it, but I wanted to give a taste of what was up. That was another one we had worked on together back at my house in Los Angeles. That was a lot of fun, those sessions, for sure. Are you going to be playing any of these at your shows coming up? I’m not 100 percent yet. I know a lot of bands do that, and I have lot of respect for bands who road test their tunes. I’ve always been the guy at the concert that when a band busts out a tune I’ve never heard, I find it’s hard for me to stay focused. Not to stay focused, but I always notice in the audience the energy shifts to more stand here and listen. You almost lose a little bit of the motion in the crowd and all that. So I tend to be the guy to hold off on playing new songs until at least they’ve gotten out there, or with that said until they’re well finished and you know exactly what’s going on. I’m at the stage in the record right now where we’re still doing guitar overdubs and polishing off a lot of songs. So I would be inclined to say not necessarily, but you never know. Maybe one will pop up in the course of doing this thing. I remember you were feeling some pressure and stressed out when you were working on Glass Passenger. Are you more relaxed on this album? Absolutely. I think a lot of Passenger’s stress – there were some serious shifts within the record company during the process of making Passenger. There were a lot of moments where I wasn’t sure who I was even supposed to be playing music for and who was signing off on my budget. You know what I mean? I think when business is a factor in the creative process, that’s a pretty scary and unfortunate setting. I’m one of these guys who knows there’s business to be done around any record, but to the extent that it starts creeping into the process, I pretty much shut down. There were definitely moments in Passenger where it started becoming a little overwhelming that I had to shut the whole production down and just wait until things sorted themselves out. That said, I think we learned a lot. I learned a lot about what I need and the best way to surround the producing of a record and managing this sort of large scale, major label environment. To that extent, the label’s been very supportive of that and what I need to make a good record. Not to say to totally stay out of my way. Obviously, you got to play things for these guys as time goes on, but I think they’ve been really supportive of a natural creative process and we’ve figured out how to work best together. So it’s been pretty positive all around. You’re also working with a different producer for the first time on this record other than Jim Wirt. How has that affected things? It’s been really good. It took me a minute. I worked with a handful of people in the early stages hatching these songs, trying to figure out what the right environment was for it. Then ultimately I went out this summer and took a minute on my own. As I tend to do when I’m a little unsure of things, I’ll get in my car and drive. I picked up a car in Virginia after a charity gig we did for a friend out there and drove back across the country. Along the road, a light bulb went off and I reached out to Jim Scott. He’s long since been an engineer-producer that I’ve really been impressed by. He was one of Rick Rubin’s main engineers. He worked on Californication and By the Way for the Chili Peppers. He engineered my favorite record of all time, Tom Petty’s Wildflowers album, and he also did “Last Dance with Mary Jane.” He was an engineer on that record. In recent history, he produced the last Wilco record and engineered and mixed Sky Blue Sky, which is an album I’m a huge fan of, too. Jim is no question one of these dudes. Time and time again, great bands have gone to him to put their records together. So I called him from the road and he said, “Yeah, man. Let’s do it.” We’ve sort of been working ever since. I think as a result, you’re going to get one of the more honest offerings from Jack’s Mannequin. It’s going to come from the heart, and it’s not going to be real processed. It’s not going to be real affected by production. It’s going to be a pretty naked, honest representation of what it is we do, both in the studio and on the road. Last Friday, you announced your new bass player, who goes by the nickname “The Kid.” What has he brought to the table during this process? At this point, we’re kind of recording as a three piece in the interest of not shaking up the chemistry in the studio. I don’t doubt that maybe Mike will make an appearance towards the later elements and later portions of putting the album together. But at this moment, what we’ve got going now is me and Bob and Jay have been learning all these songs as a three piece together and recording them like that, with Bobby playing bass, me playing piano and Jay on drums. Then we go in after the fact and overdub Bob’s guitars. I think at this point we’re trying to maintain that chemistry of three dudes that have been onstage together for five or six years, even more if you consider Bobby’s time in Something Corporate with me. Mike has been an amazing addition. We’ve only done a couple shows with him but we’re becoming fast friends. He’s a talented dude we’re definitely glad to have onboard. This last decade your music career has been quite a journey. Where do you see yourself progressing coming up in the future? I think time will tell. At this moment, I’m really enjoying this more unfettered approach to life and to music, and just being as honest as possible, which has always been my approach to some extent. Taking this moment to celebrate the fact that I’ve been a touring musician for a long time, and I feel like as a result I’ve learned how to play in a band. I see us hopefully getting to the point where we’re doing records like a lot of my heroes did records. Getting in there and not overthinking it, not overdoing it. Making honest music, and making it in a way that doesn’t require it to be a tortured process but instead very free. Hopefully, we’re entering an era where I don’t put out records every three years but maybe every year, year and a half. Whether those records are 12 songs and your favorite songs of all time – maybe I’m putting out a record where this guy gets four or five of them and this girl over here gets four or five. I just keep doing that and build a catalogue people want to see on the road every year, come out to a show, and get to catch the new songs and the old ones you like. I think that’s where I see myself going. Do you have a ballpark idea on when the new record will get released next year? I always get myself in trouble with statements like this because I tend to say something and the other thing happens. In a dream world, I see this record coming out in the spring or the summer of 2011. Speaking to my earlier point about trying not to overthink things, but just get music out there into people’s hands and let them be the judge, that’s kind of what I’m gunning for. But that can always change by six months, depending on the business that surrounds it.